1 D None No Power Seat 1 D is a standard Business Class seat, however, the proximity to the lavatories and galley may be bothersome. There is no floor storage for this seat during takeoff and landing. 1 F None No Power Seat 1 F is a standard Business Class seat, however, the proximity to the lavatories and galley may be bothersome. There is no floor storage for this seat during takeoff and landing. 10 A None No Power Seat 10 A is a standard Economy Class seat with additional legroom, however, passengers requiring a bassinet are often seated here, which may be bothersome. There is no floor storage for this seat during takeoff and landing. The tray table and video monitor are in the armrest, making the armrest immovable and slightly reducing seat width. 10 B None No Power Seat 10 B is a standard Economy Class seat with additional legroom, however, passengers requiring a bassinet are often seated here, which may be bothersome. There is no floor storage for this seat during takeoff and landing. The tray table and video monitor are in the armrest, making the armrest immovable and slightly reducing seat width. 10 C None No Power Seat 10 C is a standard Economy Class seat with additional legroom, however, passengers requiring a bassinet are often seated here, which may be bothersome. There is no floor storage for this seat during takeoff and landing. The tray table and video monitor are in the armrest, making the armrest immovable and slightly reducing seat width. 10 D None No Power Seat 10 D is a standard Economy Class seat with additional legroom, however, passengers requiring a bassinet are often seated here, which may be bothersome. There is no floor storage for this seat during takeoff and landing. The tray table and video monitor are in the armrest, making the armrest immovable and slightly reducing seat width. 10 E None No Power Seat 10 E is a standard Economy Class seat with additional legroom, however, passengers requiring a bassinet are often seated here, which may be bothersome. There is no floor storage for this seat during takeoff and landing. The tray table and video monitor are in the armrest, making the armrest immovable and slightly reducing seat width. 10 F None No Power Seat 10 F is a standard Economy Class seat with additional legroom, however, passengers requiring a bassinet are often seated here, which may be bothersome. There is no floor storage for this seat during takeoff and landing. The tray table and video monitor are in the armrest, making the armrest immovable and slightly reducing seat width. 10 H None No Power Seat 10 H is a standard Economy Class seat with additional legroom, however, passengers requiring a bassinet are often seated here, which may be bothersome. There is no floor storage for this seat during takeoff and landing. The tray table and video monitor are in the armrest, making the armrest immovable and slightly reducing seat width. 10 J None No Power Seat 10 J is a standard Economy Class seat with additional legroom, however, passengers requiring a bassinet are often seated here, which may be bothersome. There is no floor storage for this seat during takeoff and landing. The tray table and video monitor are in the armrest, making the armrest immovable and slightly reducing seat width. 10 K None No Power Seat 10 K is a standard Economy Class seat with additional legroom, however, passengers requiring a bassinet are often seated here, which may be bothersome. There is no floor storage for this seat during takeoff and landing. The tray table and video monitor are in the armrest, making the armrest immovable and slightly reducing seat width. 27 A None No Power Seat 27 A is a standard Economy Class seat with limited recline and the proximity to the lavatories may be bothersome. 27 B None No Power Seat 27 B is a standard Economy Class seat with limited recline and the proximity to the lavatories may be bothersome. 27 C None No Power Seat 27 C is a standard Economy Class seat with limited recline and the proximity to the lavatories may be bothersome. 27 H None No Power Seat 27 H is a standard Economy Class seat with limited recline and the proximity to the lavatories may be bothersome. 27 J None No Power Seat 27 J is a standard Economy Class seat with limited recline and the proximity to the lavatories may be bothersome. 27 K None No Power Seat 27 K is a standard Economy Class seat with limited recline and the proximity to the lavatories may be bothersome. 28 D None No Power Seat 28 D is a standard Economy Class seat with limited recline and the proximity to the lavatories may be bothersome. 28 E None No Power Seat 28 E is a standard Economy Class seat with limited recline and the proximity to the lavatories may be bothersome. 28 F None No Power Seat 28 F is a standard Economy Class seat with limited recline and the proximity to the lavatories may be bothersome. 29 A None No Power Seat 29 A is a standard Economy Class seat with additional legroom, however, the Exit Door protrusion and the proximity to the lavatories may be bothersome. There is no floor storage for this seat during takeoff and landing. The tray table and video monitor are in the armrest, making the armrest immovable and slightly reducing seat width. 29 B None No Power Seat 29 B is a standard Economy Class seat with additional legroom, however, the proximity to the lavatories may be bothersome. There is no floor storage for this seat during takeoff and landing. The tray table and video monitor are in the armrest, making the armrest immovable and slightly reducing seat width. 29 C None No Power Seat 29 C is a standard Economy Class seat with additional legroom, however, the proximity to the lavatories may be bothersome. There is no floor storage for this seat during takeoff and landing. The tray table and video monitor are in the armrest, making the armrest immovable and slightly reducing seat width. 29 D None No Power Seat 29 D is a standard Economy Class seat with additional legroom, however, the proximity to the lavatories may be bothersome. Passengers requiring a bassinet are often seated here. There is no floor storage for this seat during takeoff and landing. The tray table and video monitor are in the armrest, making the armrest immovable and slightly reducing seat width. 29 E None No Power Seat 29 E is a standard Economy Class seat with additional legroom, however, the proximity to the lavatories may be bothersome. Passengers requiring a bassinet are often seated here. There is no floor storage for this seat during takeoff and landing. The tray table and video monitor are in the armrest, making the armrest immovable and slightly reducing seat width. 29 F None No Power Seat 29 F is a standard Economy Class seat with additional legroom, however, the proximity to the lavatories may be bothersome. Passengers requiring a bassinet are often seated here. There is no floor storage for this seat during takeoff and landing. 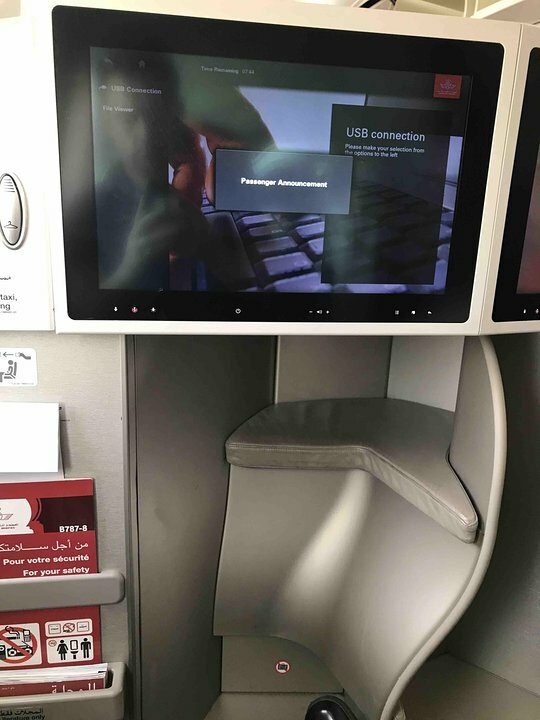 The tray table and video monitor are in the armrest, making the armrest immovable and slightly reducing seat width. 29 H None No Power Seat 29 H is a standard Economy Class seat with additional legroom, however, the proximity to the lavatories may be bothersome. There is no floor storage for this seat during takeoff and landing. The tray table and video monitor are in the armrest, making the armrest immovable and slightly reducing seat width. 29 J None No Power Seat 29 J is a standard Economy Class seat with additional legroom, however, the proximity to the lavatories may be bothersome. There is no floor storage for this seat during takeoff and landing. The tray table and video monitor are in the armrest, making the armrest immovable and slightly reducing seat width. 29 K None No Power Seat 29 K is a standard Economy Class seat with additional legroom, however, the Exit Door protrusion and the proximity to the lavatories may be bothersome. There is no floor storage for this seat during takeoff and landing. The tray table and video monitor are in the armrest, making the armrest immovable and slightly reducing seat width. 3 A None No Power Seat 3 A is a standard Business Class seat, however, the proximity to the lavatories and galley may be bothersome. 3 C None No Power Seat 3 C is a standard Business Class seat, however, the proximity to the lavatories and galley may be bothersome. 3 D None No Power Seat 3 D is a standard Business Class seat, however, the proximity to the lavatories and galley may be bothersome. 3 F None No Power Seat 3 F is a standard Business Class seat, however, the proximity to the lavatories and galley may be bothersome. 3 H None No Power Seat 3 H is a standard Business Class seat, however, the proximity to the lavatories and galley may be bothersome. 3 K None No Power Seat 3 K is a standard Business Class seat, however, the proximity to the lavatories and galley may be bothersome. 39 A None No Power Seat 39 A is a standard Economy Class seat in the last row of this aircraft and has limited recline. The proximity to the lavatory and galley area may be bothersome. 39 C None No Power Seat 39 C is a standard Economy Class seat in the last row of this aircraft and has limited recline. The proximity to the lavatory and galley area may be bothersome. 39 D None No Power Seat 39 D is a standard Economy Class seat with limited recline and the proximity to the lavatory and galley area may be bothersome. 39 F None No Power Seat 39 F is a standard Economy Class seat with limited recline and the proximity to the lavatory and galley area may be bothersome. 39 H None No Power Seat 39 H is a standard Economy Class seat in the last row of this aircraft and has limited recline. The proximity to the lavatory and galley area may be bothersome. 39 K None No Power Seat 39 K is a standard Economy Class seat in the last row of this aircraft and has limited recline. The proximity to the lavatory and galley area may be bothersome. 40 D None No Power Seat 40 D is a standard Economy Class seat in the last row of this aircraft and has limited recline. The proximity to the lavatory and galley area may be bothersome. 40 E None No Power Seat 40 E is a standard Economy Class seat in the last row of this aircraft and has limited recline. The proximity to the lavatory and galley area may be bothersome. 40 F None No Power Seat 40 F is a standard Economy Class seat in the last row of this aircraft and has limited recline. The proximity to the lavatory and galley area may be bothersome. Royal Air Maroc operates their Boeing 787-8 with a two class cabin for long-haul routes. There are 18 Business Class seats and 256 Economy Class seats. While the "Soft Product" was enjoyable, with good food and friendly service, hard product is a bit bizarre. 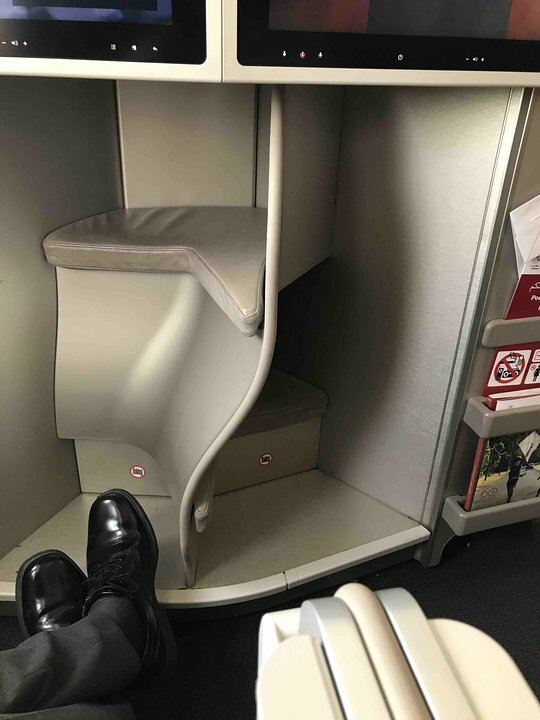 Foot rests are set so that the window seat in business class is significantly higher when in full recline than the aisle seat. Its a strange attempt at privacy I guess. All in all, a great bang for the buck if you are looking for cheaper alternatives to the U.S. from Europe. Royal Air Maroc flies 1 versions of Boeing 787-8.